On the way home on Saturday, I stopped off at an Asian supermarket close to where we live. It’s a ramshackle, haphazard kind of place, piled high with a huge range of things. There are sacks of rice piled high, fruit and vegetables – big bunches of coriander, five for a quid, coconuts, curry leaves, chillies, small aubergines, and – this time – crates and crates of watermelons for £1.50 each. There are racks full of spices, in big, heavy bags for pennies, everything from cumin, to paprika, mustard seeds, coriander seed, cinnamon, turmeric … absolutely everything under the sun. I never tire of these places. They’re exciting and vibrant. They’re the places that make Bradford a great place, and they’re a great resource for anybody who cooks. There’s absolutely no need to pay a supermarket an exorbitant amount of money for small and mean jars of past-it spices when there are places where you can buy far, far better spices for a fraction of the price. I’d bet that a tenner spent in one of Bradford’s many Asian supermarkets would establish a very fine store cupboard of spices, enough to make pretty much any curry you fancied. This time, I bought one of those watermelons with the sole aim of decanting a bottle of vodka into it through a funnel (I know, I know … ), a big bunch of coriander and a bag of spices to make this curry. 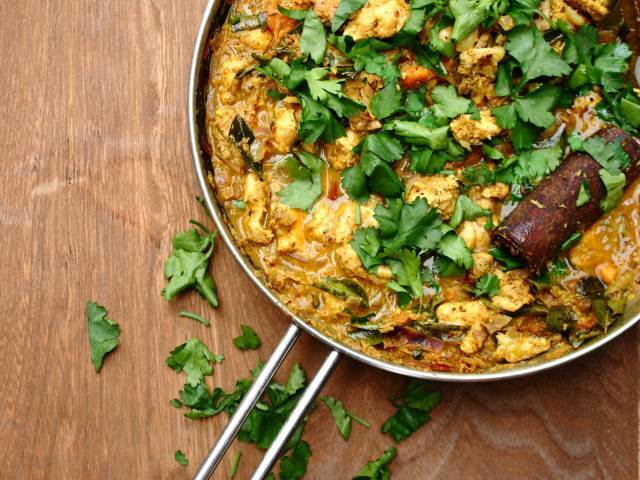 It’s a basic chicken curry, but one that has a deceptive depth of flavour. There’s a lot going on in there, but it’s very easy to make. The backbone of this curry is desiccated coconut, that’s been gently roasted in a dry frying pan until it turns a golden brown. The coconut’s natural nuttiness starts to shine through when coconut is toasted like this, but it’s a dangerous game – a second’s distraction can mean that your coconut burns, so keep an eye on it. Toast about 50g in total, and set it aside in a bowl when it’s done. Next, some spices – toast two cinnamon sticks, two star anise, two dried red chillies, a teaspoon of black peppercorns and two teaspoons of fennel seeds in the same way, in the same pan. The spices will darken and roast, and will smell wonderful. you’ll feel the chilli catch the back of your throat. After a few minutes, add two teaspoons of ground coriander and half a teaspoon of chilli powder, and continue to toast for a couple more minutes. Fish out the cinnamon sticks and star anise and set aside, and add the toasted coconut, a teaspoon of ground turmeric and half a teaspoon of salt. Add enough water to the pan to make a very thick paste, cook for a few minutes, and then transfer the lot to a pestle and mortar, or more sensibly, to a blender of food processor, and obliterate it into a smooth paste. This is your spice paste, the heart of the curry. Heat a big glug of vegetable oil in a large pan and fry two finely chopped red onions with a couple of cloves of crushed garlic and a similar amount of grated fresh ginger until the onions are soft and have taken on a little colour. Add the spice paste back into the pan, and return the reserved cinnamon and star anise, along with a big handful of fresh curry leaves and three or four skinned and roughly chopped tomatoes. Let everything bubble away for a few minutes until the sauce starts to thicken, and then add 500g of boned, skinned chicken cut into serving pieces of about three or four centimetres. I simply bought a whole chicken, skinned it and carved the meat away, which is by far the cheapest way of doing this, and which also leaves you with an extremely stock-friendly carcass. Bring to a simmer, cover and allow to cook for ten minutes, then remove the lid and give it another five minutes. The chicken should be cooked through and the sauce thick and rich. Add a squeeze of lemon, a handful of chopped coriander leaves and serve with rice. There are several good ones – the one I normally go to is Pakeezah a little way up Leeds Road in Bradford (drive in on Canal Road, and keep going before turning left just before the Yorkshire Building Society building, then it’s on your left. There’s another great place up behind the university called Haqs.